The highly anticipated seventh season of Mad Men kicks off tonight and we will be watching as Don Draper and company draw us back into to their mid-century machinations in a way we will miss dearly when they are gone. It’s truly the end of an era. We will be releasing some exciting new mid-century modern products at High Point Market in a few weeks, which has inspired us to present these offerings through the lens of this moody television show. 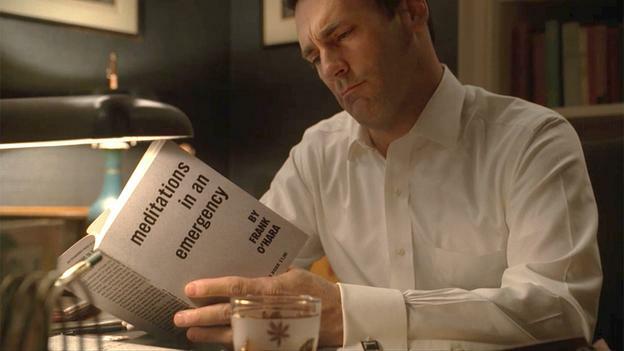 He’s reading from the poem “Mayakovsky,” which first appeared in print in 1957, the choice for this drama one of many brilliant moves the television series’ creator Matthew Weiner has made during the show’s storied history. That’s because Draper’s odyssey superbly depicts the experimentation and chaos of 1960s New York City, as does O’Hara’s story and poetry, and the work and lives of the artists he gathered around him even before he was an executive at the Museum of Modern Art. The poem Don is reading pays homage to Vladimir Mayakovsky, a Russian Futurist whose work O’Hara held in high esteem. The theme is spot-on in its tone given that the “catastrophe” of O’Hara’s and Draper’s personalities make them both model citizens of their time—a sliver of history that stirs up a cocktail of images signifying a new American age replete with its own art and literary royalty, which was dubbed the New York School. Accompanying this caldron of creativity at the time were the intersecting worlds of design and architecture—Bauhaus and Scandinavian sensibilities intermingled with European Modernism and a surge in American ingenuity to create a watershed moment for new thinking. A handful of the brightest stars during this time were Florence Knoll, Georg Jensen, Hans Wegner, Eero Saarinen, Harry Bertoia, Frank Lloyd Wright, Ray and Charles Eames, Alvar Aalto, Arne Jacobsen, Ludwig Mies van der Rohe and George Nelson, to name a scant few. 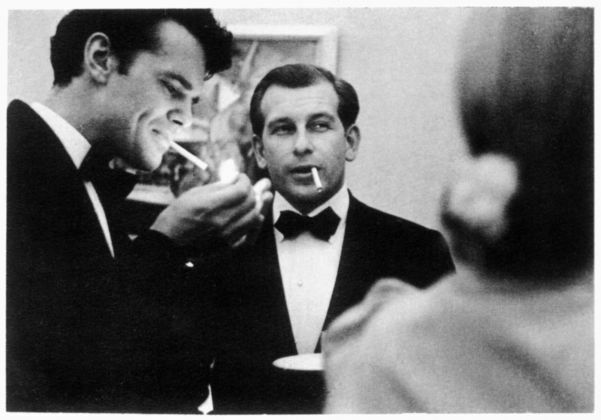 Charles Eames and Eero Saarinen dishing on design at Cranbrook. The Mad Men production team, led by Weiner, got this part right, too, tapping furnishings by some of these visionaries for the backdrops that allowed this period drama to resonate to its core. One episode during the same season in which Don reads O’Hara’s poetry finds Betty Draper reclining on a Barcelona chaise during psychotherapy, her neck gingerly placed on the black leather bolster to maintain her perfect coif. In creating such a sophisticated representation of the era in design, Weiner’s team enticed an entirely new audience toward the mid-century modern aesthetic, overreaching those of us who live, breathe, eat and sleep design heritage. 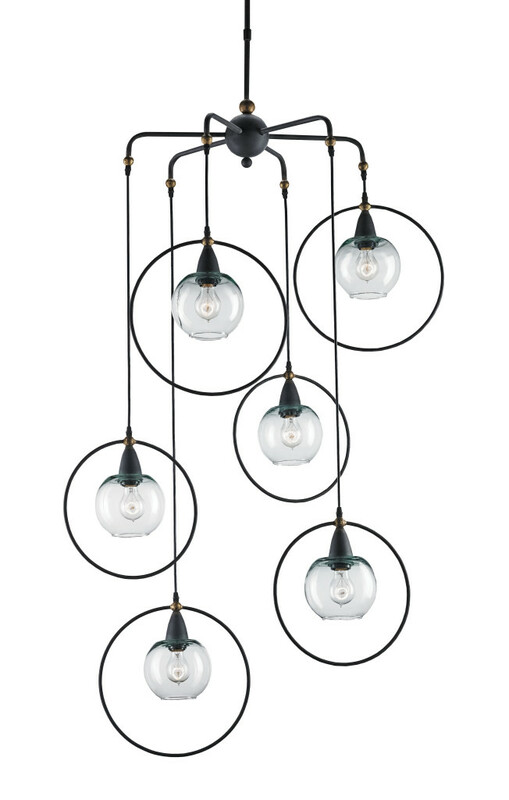 Currey & Company’s Moorsgate Multi Pendant with six lights, made of wrought iron and recycled glass. When I noticed that Currey & Company was chief among the savvy manufacturers who’ve realized the style is now a solid fixture on the scene, I was not surprised; and the new products they will unveil at High Point Market in a few weeks sets the fashionable mid-century modern bar high. I was particularly taken by the lighting I saw as creative director Cecil Adams showed me the new collections. The two light fixtures I tapped to illustrate this post exemplify one of the most fascinating things about the era from a design perspective: by the early 60s, the coexistence of disparate expressions were on the radars of enlightened American style-setters. Both paired-down simplicity and elegant ornateness had made their way into the marketplace. The ultimate in traditional craftsmanship suddenly existed side-by-side with the height of experimentation. And handcrafted genuineness gave up some of its territory to machined leanness. 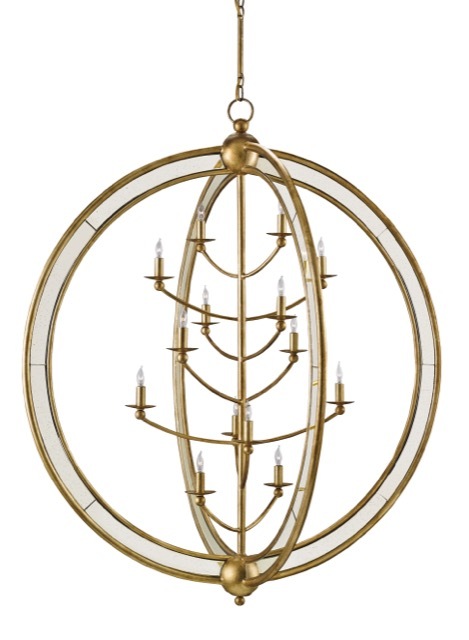 Aphrodite chandelier with 14 lights made of light antique mirror and wrought iron in a gold Granello finish. Walton was a contemporary artist, journalist and close friend of the Kennedy family, as well as an advisor to the First Lady, aiding her with the redecoration of the White House. He had suggested the gallery as a perfect choice because it was widely known as hotbed for cutting-edge contemporary art in a city lauded for the most avant-garde art anywhere. This is a perfect example of how worlds collided during this time—making life challenging culturally when civil rights and gay rights took explosive turns—and expansive creatively when censorship gave way to poets and artists being able to express themselves even in the edgy terms O’Hara and company now personify. But tradition wasn’t about to forfeit its hold. Consider the fact that Henry Francis du Pont also advised the First Lady on her White House makeover. Can you imagine two satellites of influence farther apart than the American collector and horticulturist, and the contemporary artist who escorted Jackie Kennedy into that art gallery? I certainly can’t. And if you’ve ever doubted why the First Lady represents such an arbiter of taste still, consider that she had the vision to gather around her such an eclectic group of advisers. This made her an early example of the nonconforming female influencer that ushered design toward the personal reflection of our very selves it is today. I, for one, would like to thank her! 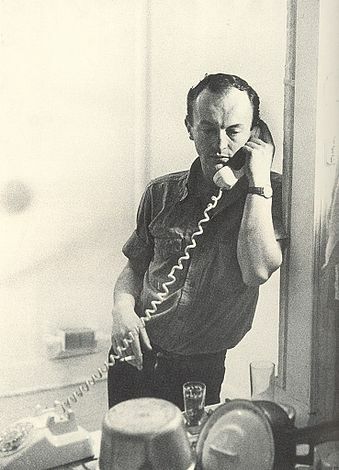 Frank O’Hara, photographed in 1965 by Mario Schifano. Ironically, Frank O’Hara never lived in posh digs but his influence on those who did was substantial. His life was bohemian to the core: even after his star had risen at MoMA, his typewriter was always on his kitchen table and unwashed dishes filled his sink. But he didn’t need the table for meals because his powerful position put him first on everyone’s guest list. In fact, it was di rigueur for hosts and hostesses to handwrite on their invitations, “Frank will be there!”—a tactic that drew some of the world’s wealthiest collectors and most popular artists to the city’s fashionable gatherings. By the early 60s, O’Hara was traveling the world organizing collections for the Museum, visiting and spending time with artists whose names we have come to know as contemporary and pop art’s early movers and shakers, many of them owing him a debt of gratitude for their spot on the roster of this era. His incongruous legacy as a globetrotting, bow-tied art-world idol AND the creator of poetry so gritty it would inspire Weiner to use it to portray a New York City ad man’s disintegrating life has kept the mystique surrounding O’Hara’s legacy in tact during the past nearly five decades since his death. It also makes him marvelously modern, an aspiration he penned in “Mayakovsky.” And no doubt, Draper is of this poet’s tribe because O’Hara’s life held a similar tone of upheaval until his early death at the age of 40 on a Fire Island beach in 1966. The writers and painters who mourned him had become the new establishment through their sheer bravado. By daring to force a departure from the status quo, they created a new style that forever changed art and literature’s landscapes. Following suit, design’s big names made news thanks to visionaries like Florence Knoll and Herman Miller, both keen to produce furniture by the new guard. 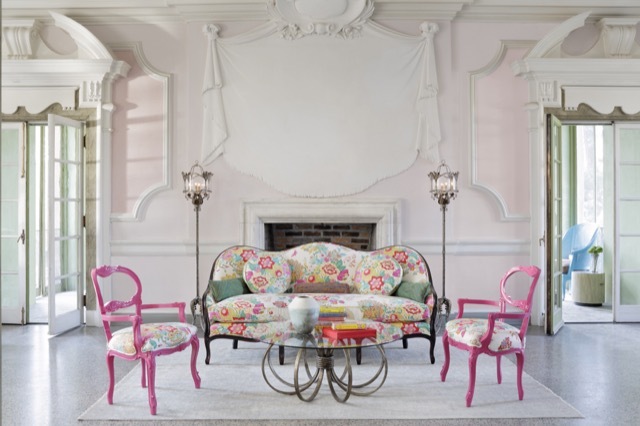 Zara torchières, in Currey & Company’s Winterthur Collection. 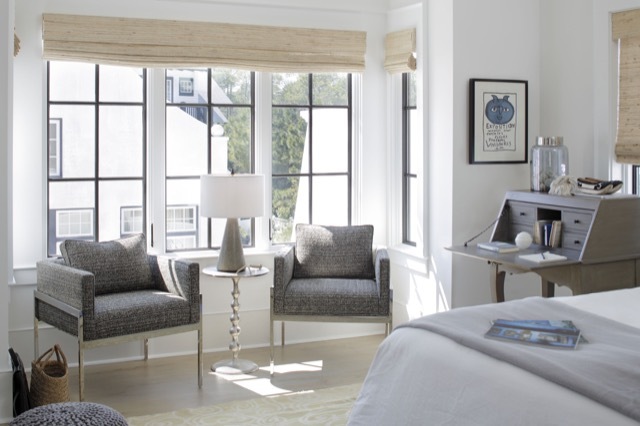 Photography by Mali Azima; art direction/styling by Thea Beasley; image courtesy Currey & Company. By paying close attention to heritage of any era when producing new collections, Currey & Company is one of the manufacturers serving its customers well. Think of the fact that the new products being released soon not only call to mind the glory days of Mad Men but also include designs inspired by du Pont’s renowned Winterthur Collection and other stylistic periods. This is the level of thoughtfulness it takes to leave a legacy, a concept that every visionary mentioned in this post nailed so brilliantly whether they were cognizant of it or not. Mid-century modern standouts from Currey & Company include the Babylon Table Lamp, the Hookah Table and the Gilles Chair. Photography by Mali Azima; art direction/styling by Thea Beasley; image courtesy Currey & Company. Text of The End of an Era Is Here © Currey & Company, all rights reserved. Saxon Henry is a content strategist who also blogs as The Modern Salonnière. This entry was posted in Currey & Company, History, Products and tagged black, Chandeliers, design trends, floor lamps, Floral, Furniture, Gold, Leather, Lighting, Mid-Century, Modern, seating, Table Lamp, Winterthur, writing desks on April 5, 2015 by Currey & Company. Thank YOU for giving me the opportunity, Bethanne!